A football player has studs on his shoes to provide a better grip on the field. The wheels of the ELIET Edge Styler PLUS PRO were also equipped with rubber studs to have a better grip on the lawn, especially when it is wet. This offers the extra advantage that your terrace will not be damaged when you drive over it. The ELIET Edge Styler PLUS PRO has an engine with an integral reduction gearbox. This enables the torque to be increased approximately 6-fold. Consequently, the engine does not have to run at full throttle. 2,800 rpm is more than ample to provide enough power to the blade and the wheel drive. This characteristic improves the petrol consumption, and the operator also benefits from a reduced noise level. These days landscaping allows for unlimited creativity. Lawns with straight corners were replaced by free-form lawns. The Edge Styler PLUS PRO was designed to, in addition to the classic straight borders, also install those round shapes without any problem. The knife moves at the level of the axle line of the two carrying wheels which insures that it seamlessly follows the wheels' tracks. This makes it easier for the operator to form the desired round shapes. The ELIET Edge Styler PLUS PRO features an "ratcheting step pedal" on the lower right of the machine, allowing the operator to use the strong leg muscles to position the blade to the desired work position prior to inserting it into the soil. The release handle for the blade mechanism is on the left-side handle grip. Elevate the rear of the machine off the soil and squeeze the handle to release the blade control mechanisim. Step on the pedal repeatedly until the blade has racheted to the desired work position. Then lower the rear-end of the machine and guide the blade into the soil. Because the machine makes stabbing movements to create the lawn edges, this logically creates pulsating or jolting movements, which is unpleasant for the operator. The ELIET Edge Styler PLUS PRO tries to offer the operator optimum comfort and ergonomics. As already noted, special care was taken to lower the vibration level for the operator. This avoids tiring the upper body when working long hours. In order to give the operator the ideal bearing during use, the height of the steering wheel can be adjusted continuously. Because the machine was also designed to maintain the edges of bunkers on golf courses, the steering wheel can also be adjusted sideways at an angle so that the operator can work in a comfortable position independent from the waves and slopes of the terrain. The blade that digs the cable into the ground is on the side of the machine, offering the user an excellent view of the working area. It also ensures more freedom of movement in the curves. The specially designed blade meticulously cuts through the grass turf without causing any visible damage. The DC wire is fed through the blade via a tube and dug into the lawn at a depth of approximately 5 cm. 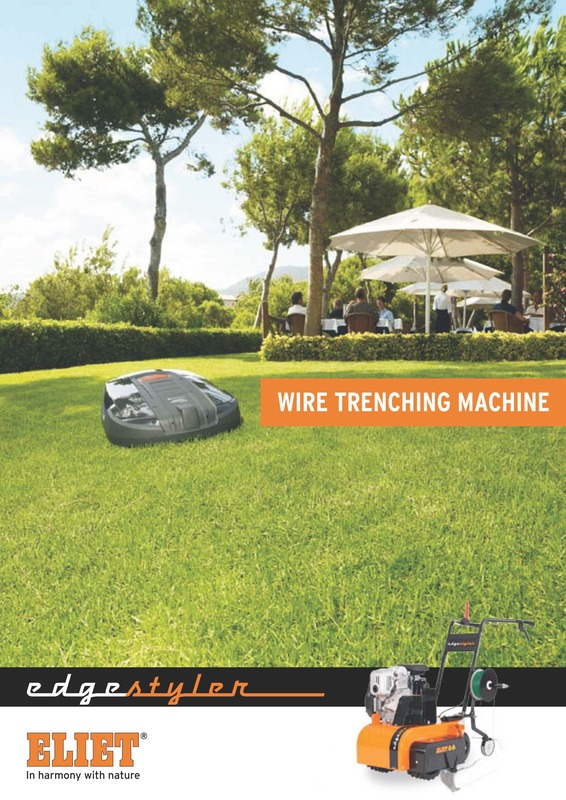 At this safe depth, the wire doesn't risk being damaged during later lawn treatment such as aerating or overseeding. The Edge Styler PLUS PRO comes with a coil support that can be adapted to several types of wire spools.